C.I.E.L.O. 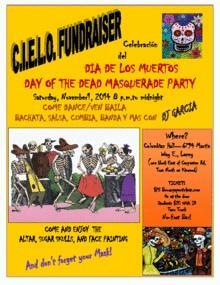 Project is having its 3rd annual "Día de los Muertos/Day of the Dead" Celebration fundraiser to support our language and literacy programs. You may well know that "Day of the Dead" is a special holiday in the Latino world which celebrates the natural phenomenon of death in a positive way, while remembering and honoring those who have gone before.Our fundraiser strives to bring a version of this tradition to south sound in the form of a masquerade dance party with typical Day of the Dead decorationslights & candles, sugar skulls & flowers, and a Mexican "altar." This year's music will feature a premier local DJ, "Garcia Entertainment," and includes a performance by Samba Olywa's "Bone Gang."